This type of scenario can cause quite a panic for any homeowner. Just imagine: you return home after a long, hard day of work. You decide to rest on your sofa for just 10 minutes. As you recline and let out a well-deserved sigh of relief, you look up and notice your drywall ceiling is sagging. All thoughts of rest are immediately replaced with dread. A sagging drywall ceiling is a serious problem. In fact, the world is working against you on this one, as the greatest issue here would be gravity. This is not something you want to leave unchecked as you can never be certain when the ceiling will come crashing down, which is a major safety risk for you and your family members. One of the most obvious causes of a sagging drywall ceiling is usually water. If you have a leak anywhere in your roof, it will eventually lead to an accumulation of water. Over time, the weight of the water combined with gravity will cause the panel to start sagging. However, if you've ruled out water as the culprit it could be one of two other issues. Firstly, there are not enough screws holding the drywall sheets in place. There should be a 4-inch screw in place at least every 12 inches. It could also be that your ceiling beams are too far apart so even with the correct amount of screws, the weight of the sheets will, over time, start to sag. If the problem isn't too bad, the quickest and easiest solution is to reinforce the drywall ceiling by increasing the amount of screws. If the sagging isn't too bad, this should correct the problem. Once your ceiling is nice and level again, it is a simple matter of applying some joint compounds over the screws and then re-painting the entire ceiling to achieve a seamless finish. If the beams are too far apart, you can always have a few new ones added in between the old ones to act as a brace, and to have the sheets secured with a few more screws. Unfortunately, if the problem has been neglected for too long you may have no other alternative than to remove the ceiling and install a new one in its place. 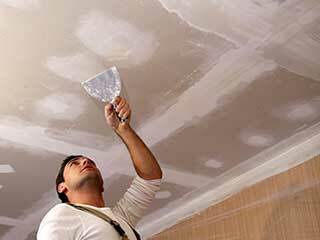 Our experts at Drywall Repair & Remodeling Hollywood can help you fix problems with your ceiling or any other part of your property.